There’s a change of venue for the traditional Ross Lions’ Annual Bonfire and Fireworks Display for 2018. This year, Ross Rowing Club ground is the place to see the Display on Saturday November 3rd. This event has taken place (regardless of the weather!) for many years, so this year’s event will maintain the tradition and the aim is to make an event for all local families to enjoy. Entry will cost £6 per adult and £4 per child (aged 16 or under) and this can be paid on the gate. Family tickets for adults with children will prove good value for those who come together. This is a charity fundraising event and by supporting Ross Lions Club you can be sure that every penny raised is used for charitable causes. The Lions and volunteer helpers join together to sell hot-dogs, burgers, and drinks. The Ross Youth Lions (Leos) will be on the field selling illuminated lightsticks and flashing novelties. If people buy these from the Leos they can also be sure that the money raised will also be used for charitable causes. At 7pm, the bonfire is lit by a member of the Lions Club. 7.30pm is when the fireworks begin and plans are on track for another loud and lively display. Ross Lions are determined that everyone should have a fun and safe time, people must not bring in their own fireworks and for safety, sparklers are not allowed. There will be stewards patrolling to offer help and advice and volunteer First Aiders will also be present on the field. Ross Lions Club put on this fantastic event year after year for the people of Ross on Wye and the town’s visitors to enjoy. All profits go to Lions Charities and anyone who knows of an individual or group that need help can make contact by writing to the Secretary. To find out more about Lions, what members do and how volunteers can help, look at our website www.rossonwyelions.org where you will also find a link to our Facebook page. Anyone interested in possibly volunteering with the Ross Lions Club is welcome to contact us for a chat with no obligation. Ross on Wye Lions Club, 0845 8335786. 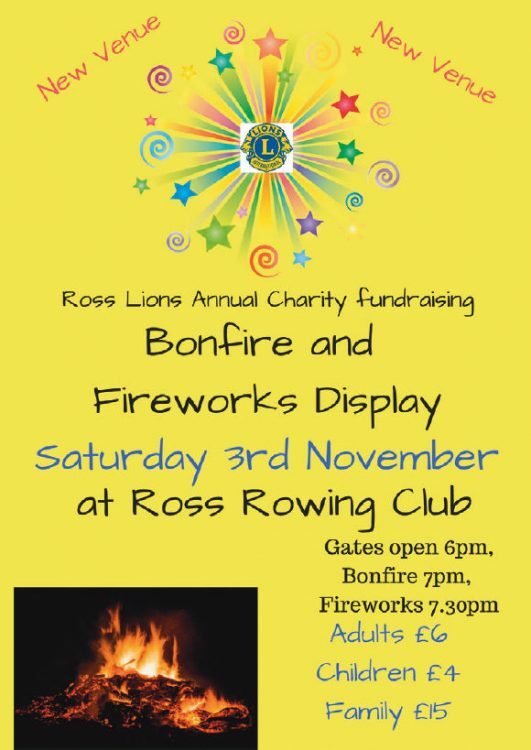 Ross Bonfire & Fireworks Display is on Saturday 3rd November at Ross Rowing Club. Adults: £6, Children: £4, Family: £5.